Are you unfortunate enough to have a blocked toilet on your hands? There are a lot of tips and tutorials online offering various ways to help you unblock it – whether you have a plunger or not. But DIY plumbers beware; you could end up doing more damage to your toilet if you’re not sure of what to do. We’ve put together a list of how not to unblock a toilet to help you steer clear of a messy and costly disaster. A lot of site online will recommend trying to unblock your toilet using boiling water to force a blockage. What they fail to mention is that the boiling water trick works best on metal pipes. If you have PVC pipes, water over 175 degrees can soften or melt the joints in your pipes. If you don’t know what kind of pipes you have, be safe and don’t use boiling water. Most drain or pipe cleaning chemicals that available in retail stores for at-home use, are not appropriate for toilets. Some drain cleaners produce a great amount of heat when they come into contact with water as a chemical reaction. If not handled properly, this heat can seriously damage the porcelain toilet bowl and the plastic pipe attached to it. Always check the product label to ensure the product is compatible for use with toilet drains. What many people fail to realise when faced with a clogged toilet, is that not all plungers are the same. 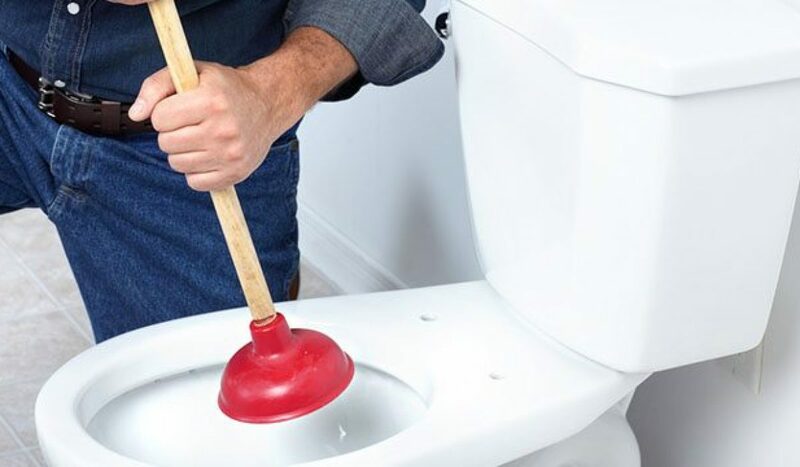 Do not use a simple cup plunger — you will need a flange plunger to unclog a toilet. These are the plungers that look kind of like a closed up bell. Flange plungers will help create the kind of suction needed to get the blockage moving along. Too many people also use a toilet plunger incorrectly, using unnecessary force and causing messy and unhygienic splashing. Do not push or pull the plunger violently when it is in the toilet bowl. It might seem tempting, but resist the urge to use a coat hanger or drain snake to force the blockage out. These tools can scratch the porcelain of the toilet, so try to be careful to minimise the damage, at least in the visible part of the bowl. The end of the coat hanger you are going to use to fish out the clog should be given a v-shaped hook by using some appropriate pliers and then covered lightly with electrical tape. Proceed with greatest caution to engage the hook onto the clog and then softly pull it out in a continuous motion. Or, just call a plumber. If you and your blocked toilet are in Sydney, save yourself the trouble, and call your local plumber from Plumbing Central on 0410 011 999. Our plumbing services are available throughout the city, across Roselands, Bankstown, Revesby, and to Peakhurst and Hurstville. We even have a 24 hour emergency service, so call us on 02 9199 9780 for quick and professional plumbing assistance.